Although Second Star is a loose re-telling of Peter Pan it truly is its own story. Wendy Darling’s brothers, John and Michael, are missing surfers who are presumed dead. Six months after their disappearance Wendy is unwilling to believe that they are gone, instead she thinks they are out surfing. Taking off on her own Wendy begins her search for them. During the search Wendy runs in to Pete who is living in an abandoned house on the cliffs. 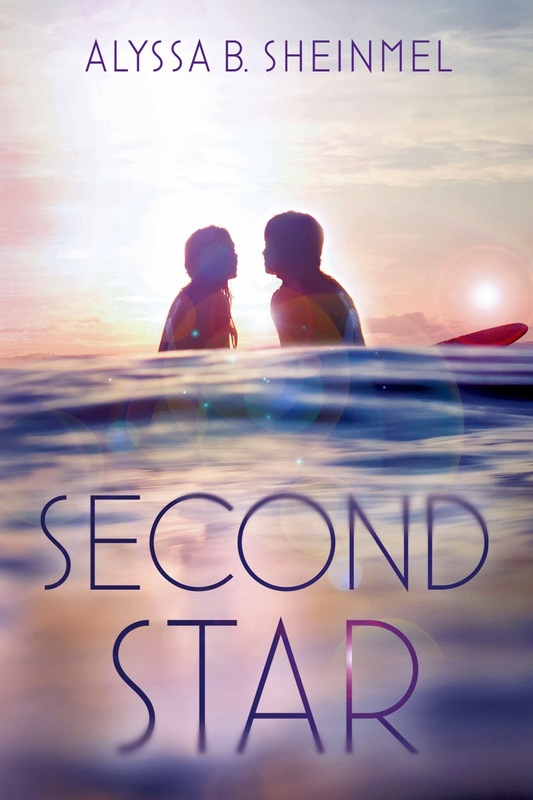 Pete is a skilled surfer and Wendy begins surfing in order to get closer to her brothers and figure out just how the ocean called to them. I really loved the setting and ambiance Sheinmel created. This novel felt like sunshine, summer, and salt air. I could easily envision Pete and Jas’s abandoned houses on the cliff above the beach. I wish I could have curled up and stayed a while longer, it was that sort of place. Speaking of Jas, he is Pete’s foil and I wouldn’t exactly call him Captain Hook. Honestly, he really doesn’t have a character equivalent in the original story. Jas is his own character. He is a drug dealer who Wendy’s brothers may have hung out with. Wendy, while looking for them, is pulled in to Jas’s world where she finds a piece of herself and I’m not really sure she wants to leave. Jas was probably my favorite character in this novel, although, I usually have a soft spot for teenage drug dealers with problems. Overall, I liked the twisty-turney plot and how Sheinmel made the timeless tale of Peter Pan truly her own. If you’re looking for a deeper sort of beach read look no further! After I read and reviewed this one I saw lots of negative reviews for it, and I thought I was alone in really enjoying the book! My favorite part about the whole book had to be the ending, because it really caught me off guard and I hope that there's going to be a sequel or companion sometime in the future! Great review! I've been interested in this book since it was first published, but I had never read any really good reviews for it. This review makes me want to buy it--now. Too bad I'm saving my money otherwise I would. I really like that it follows Peter Pan loosely (I love Peter Pan) and has Captain Hook "Jas" in it. Plus, it helps that Jas is a teenage drug dealer. Like you, I have a soft spot for them.